BEING crowned Made In Hyndburn winner was an unexpected honour for family firm Admagnetics. The company, which was founded in Burnley, has been on Huncoat Industrial Estate for 26 years. 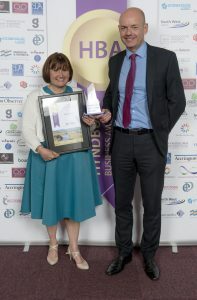 It was up against serious competition in the Hyndburn Business Awards category with finalists including Simon Jersey. Admagnetics was founded by Alan Moorhouse, who died 11 years ago. The business is still run by his wife Sallie, managing director, and their daughter Angela Sharples, a director. It manufactures bespoke transformers and standby power equipment and sells all over the UK with 35 per cent of orders exported to Europe and Russia. The presentation was held at Accrington Town Hall and when the company was named as a finalist Angela offered staff the chance to join them and they soon made up a table of 10, this included sales manager Steve Garner, who travelled from Crawley for the occasion. At the time of the awards, the company was in the process of putting together a new website and so they got the chance to promote their success far and wide.